Published: February 2004. Last updated: June 2013. GLOBE Graph showing output of variables for Maximum Air Temperature and Soil Moisture Content for the Reynolds Jr. Sr. High School in Greenville, Pennsylvania. In this chapter you will be guided through the process of locating and graphing web-based environmental data that has been collected by GLOBE Program participants. The chapter is based on an example developed for the GLOBE resource Earth System Science Investigation, which is a section of the GLOBE Teacher's Guide. This chapter highlights the opportunities for using GLOBE data to introduce basic concepts of Earth system science. As you investigate a specific case study, you will take advantage of the GLOBE Graphing Tool's features. You will superimpose four different sets of environmental data in a single graph across a two-year time frame. The resulting patterns will reveal a relationship that escapes casual observationthe seasonal changes in soil moisture. The chapter provides opportunities to discuss central Earth system concepts such as reservoirs, places where energy and matter are stored, for example, in the soil; flux, the movement of energy or matter between reservoirs, such as the evaporation of water from the soil; and the role of solar energy as one of the major drivers of flux and all Earth system processes. 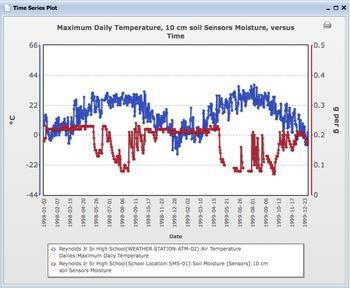 With more than 15,000 member schools throughout the U.S. and the world, the GLOBE program makes it possible for students to expand their investigation beyond a single example, to search for additional examples of seasonal soil moisture variation, and to build a more comprehensive understanding of basic Earth system processes.